Following a dinner showcasing the delights of Ecuador, Mr. Chocablog’s twitter feed was chocablock with positive pronouncements on the chocolate he’d consumed there. And, having seen the hype but not tasted the supposedly good goods for herself, Ms. Cocoa Nut was pretty pleased that he extended an invite to a sampling of the very same stuff. I’m introduced to Susana Cardenas: not only a stylishly-attired, ever-so appealing face for the brand, but also one of the two brains behind it. In addition, the freelance journalist is warm, welcoming, and endlessly enthusiastic about the chocolate I am, by now, pretty darn desperate to taste. I’m equally desperate for Montecristi not to leave the bitter taste of disappointment in my mouth; both aware and wary that too much expectation can be a spoiling seasoning when a foodstuff falls short of one’s own anticipation. And as the person pedalling this product is so likeable, I cross every digit that I feel nothing but love for the chocolate. It’s certainly chocolate with a promising pedigree. 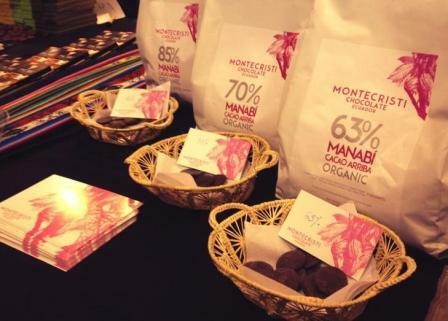 As Dom informs us in this post on taste.life, Montecristi’s manufacturing is undertaken in Quito and supervised by the company whose team keeps an eagle eye on the 1000 farmers scattered throughout the Manabi region; carefully controlling growing conditions, working practices, and, most imperative for the eater, the quality of chocolate which results from it all. And what quality! Especially when one takes time to enjoy it properly. To prove that point, Susana has us snap a button in half; first savouring the flavours fully, then scoffing the second piece like you see a hungry bloke mainline a Mars. When chocolate is quickly chewed, flavours burst brightly forth but linger little; and the eater misses out on all the depth and complexity that is slowly revealed when its just allowed to melt the mouth. Try it for yourself. The simple experiment makes a compelling case for contemplative consumption and makes you understand first hand that, when it comes to fine chocolate, patience is richly rewarded. Given the geography, one would expect a fruit flavour from this chocolate. In the 63%, it’s present; pleasant, and, to my mouth at least, pretty ‘purple’. It’s also lightly floral with a smooth, rapid melt and a little bit of grip on the finish. It’s certainly got personality – this is the kind of chocolate that makes you sit up and pay attention. The 70% is higher in cocoa but lower in acidity, with a plush, velvety melt, and tons of toffee and caramel that one would most closely associate with milk chocolate. The mellow, rounded flavours lead you to perceive it as somehow sweeter than 63%. It’s also a slightly earthy eat, with a lovely lick of fresh cream on the finish. This one is slow to melt. First comes woodsmoke on a wet day, then in come the hard herbs, particularly thyme – almost too powerful and intense for me – my response reminding me of how I first found Hotel Chocolat’s Rabot Estate Trinidad 75%. There’s a slight vegetal note, but any acidity you’d anticipate has lost its sharp edges during a longer conch time. After that terrific trio, in order to explore more from Ecuador, we also pontificated over some Pacari; a range you might recognise from it’s natty black packaging and appreciate for the unusual spectrum of featured flavours. The first chocolate we contemplate is in possession of a silver medal from the 2013 International Chocolate Awards World Final. The beans are obviously unroasted, yielding green flavours that initially envelop one’s tongue like a light, nutty-grassy olive oil. The overall impression is rather like eating a fresh nut plucked straight from the shell; biting through the tannic skin into the sweetly earthy young flesh beneath. The more I try of this blended bar, the more I like it. This, too, was slicked silver during the 2013 International Chocolate Awards World Finals, but it’s an altogether different delicacy. Slightly coffee-nosed with a wine-y aroma, it melts to mellow, roasty coffee, evolving into toffee with an underlying but pretty perceivable coconut note. I’m left feeling like I’ve just supped a cup of rich cocoa; and like I might just reach for another piece. My final finding? 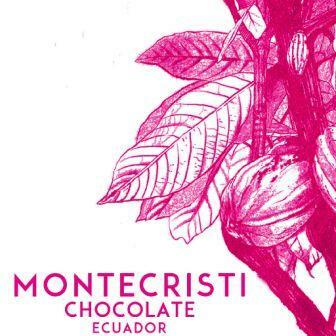 When it comes to chocolate, I could suffer much more from Ecuador.